Page 12 - KaBOOM! News | KaBOOM! “I’m the Principal at Pecan Park Elementary School in Jackson, Mississippi. Mississippi has the highest obesity rate in the country, and every day I look at my students and know that if nothing is done they will literally grow into those statistics. I looked around at my urban, inner city school, with its transient population. Most people saw it as a less than ideal place for a wellness revolution. I disagreed. For me, it really did start with a playground. 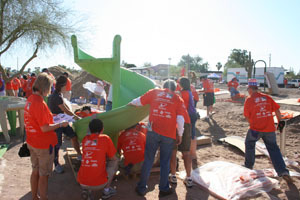 In May of 2006 we built our fantastic new KaBOOM! playground, but that was just the beginning. The playground spawned a walking trail around it for students and adults, which inspired 7 cardio stations that popped up along the trail, which leveraged a grant for fresh fruit & vegetable snacks for every kid during the school year. Wanda has created a whole new mindset at her school and in her community. It started with a dream, it started with KaBOOM! Play it forward and help us keep inspiring leaders like Wanda across the country. "I used to play at Park of the Canals when I was a kid in Mesa, Arizona and always had fond memories of it. But shortly before I moved into the neighborhood with my own family, the playground was removed for safety reasons. Ironically, that resulted in a dramatic decline in park use and it developed a sore reputation for criminal activity. 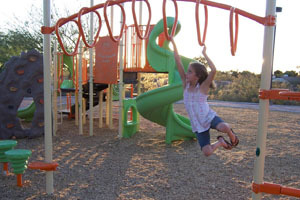 Mesa was in a budget crisis and had no funds to allocate to park improvements, so it became obvious to me that the only alternative was to mount a community effort to replace the playground and take back our park. Through the months of planning and coordinating with my community to raise funds and volunteers, my three little girls were my biggest motivation and inspiration. They can spend all day long at a park playing and having fun - but it's not just that, they are exploring, pretending, socializing, learning new things about themselves when they have the space and quality equipment to engage in unstructured play. For me, more than anything, a good park means more quality time together for families and friends. We are all losing too much of our lives fixated on a TV, computer or cell phone screen - unengaged with our love ones and the world around us." 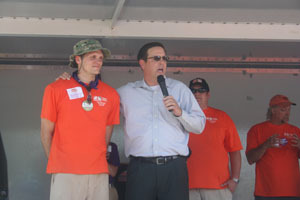 Bert wanted more for his community, and his family, so he stood up and led an amazing community build with knowledge and resources from KaBOOM! Play it forward with a donation today so dads like Bert can keep building great new places to play. 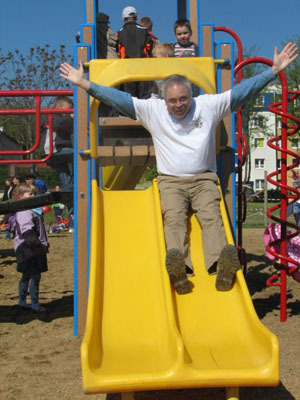 "I am an advocate for play because of the social, emotional and physical development benefits it provides for children. No other activity can accomplish these developmental elements at one time like play. A trip to a Polish orphanage changed my life. I saw first-hand what happens to kids who do not have the same opportunities for play as their counterparts in America. As a result of this first trip, I’ve built two playgrounds in Poland and two Polish children from the orphanage are now my son and daughter. After my first trip to the orphanage I knew I had to act, and I learned more about KaBOOM! I attended their annual playground-building training and received a grant that allowed me to complete my tool kit which would eventually travel with me to Poland and help construct those playgrounds. 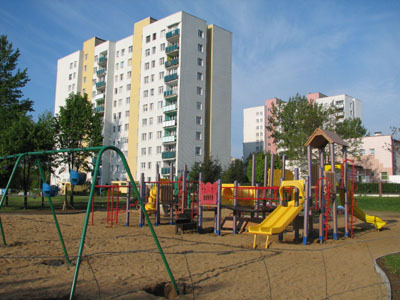 Thanks to the resources and knowledge from KaBOOM!, endless translations, SKYPE, extensive fundraising and hours upon hours of hard work we were able to complete one playground at a rural Polish orphanage (Dom Dziecka) and another at an elementary school in the city of Poznan." Mark took our online tools and resources and put them to work building 2 great new places to play for kids who really needed it. Play it forward with a donation today so we can keep improving our online tools and resources and support community builders like Mark across the country, and the world. 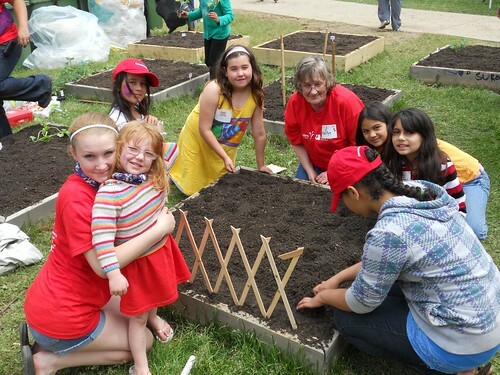 On June 11th, 2011, KaBOOM!, St. Joseph Immigrant Women's Centre and Foresters built a great new place to play in Hamilton, Ontario. The Women's Centre residents have started a local community group, working together to continually discuss situations happening on the property and how they'd like to progress things for the positive. Some of the community members involved in the planning process and many community members at the build are also starting a neighborhood association. They will be meeting weekly to discuss ways to continually improve on what is already at the center. Play it forward with a donation today, because it may start with a playground, but it doesn't end there. "I used to live across the street from a large lot of nothing, but since August 31, I sit on my porch and admire our new KaBOOM! playground. With a chalkboard, six benches and exercise stations, all in addition to the playground equipment, I think it’s the nicest, happiest playground I’ve ever seen. My family and I had been thinking about leaving our Detroit-area neighborhood, but this new playground has really improved the community and we are committed to keeping it that way. Every Sunday evening I empty the trash cans and patrol the playground for any potential vandalism. My husband tightens any loose bolts on the equipment and makes sure everything is safe and secure. I notice more animals coming out of the nearby woods, and the playground even inspired me to take my first stroll through those same woods on a nearby nature path. I’ve seen more neighbors let their kids come out and play, and I’m already planning some fun weekend activities for kids at the park. 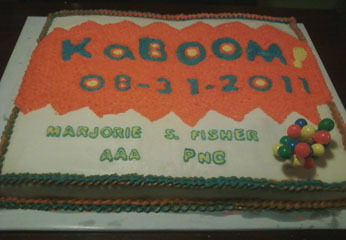 On Build Day in August I baked a huge KaBOOM! cake to celebrate, but this playground is something I celebrate every day." – Nikki Eason, Detroit, Mich.
Nikki’s tears of joy on Build Day were not just for all the local kids who would now have a place to play, but for the community that gathered to help create it. 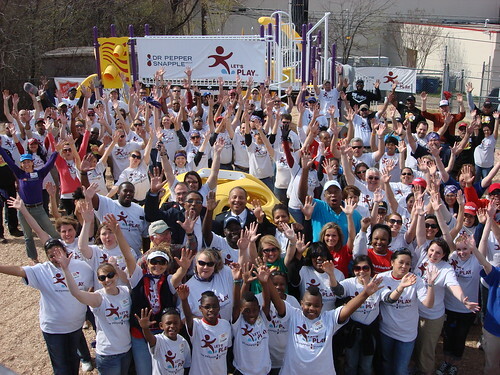 Play it forward to bring play to more communities across the country. Three weeks ago the town of Ottawa, Kansas built their first playground accessible to children with physical challenges. They’d never come together to do anything quite like this, and weren’t sure exactly where to start. But, the KaBOOM! online planner showed them how, step by step. Tara says the new playground is “a double excitement” for her family because her epileptic daughter can play there, and her wheelchair-bound mother can join the fun, too. Kelley is excited too– her daughter has spina bifida, which renders most playground equipment out of reach. The new swings with protective bars are “almost like a rocket seat---she’s always wanted to go faster, and now she can safely.” Sonny, who’s in third grade, spent his summer collecting change at local gas stations to raise money for the new playground. He ended up surpassing his goal and collected $337 all in honor of his five-year-old brother who had died a few months before. “Play it forward” with a donation today to help more communities follow Ottawa’s lead in 2012. 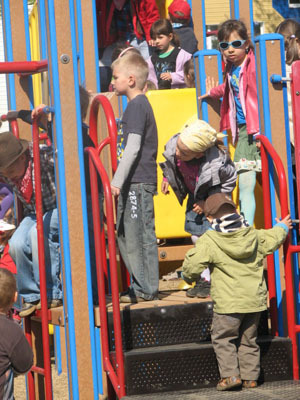 Spruce up your playground with our Let's Play Spruce Grants! Here's some inspiration. Julian, Calif.: On June 17, 2011, 20 seventh and eighth graders volunteered during their summer vacation to help re-paint black top games at the elementary school’s "Peaceful Playground." The idea for the project originated during the previous school year when these middle-school students volunteered one lunch hour per week to mentor elementary-school students during recess, helping them to peacefully resolve conflicts while developing positive relationships with the younger students.This school year, the 7th graders will be offering a similar mentorship experience on the newly spruced-up playground. Houston, Tex. : On August 20, 2011, a diverse, 14-person Spruce Team gathered for four hours to plant new heat-loving plants, rake out the engineered wood fiber, and pick up trash and debris around the playground. In spite of the oppressive heat, the atmosphere was one of good cheer and thoughtful collaboration between the school community and local businesses. Thanks to the hard work of these volunteers, over 450 children came back to find their school playground looking as good as it did when it was first built four years ago. Providence, R.I.: After Hurricane Irene, a neighborhood team organized a 24-hour "heal-a-thon" for Brown Street Park. They used social media (Twitter and Facebook) and their website to get the word out. Over 45 volunteers respond to this plea throughout the 24-36 hour period. They piled up debris, moved dead tree limbs out of the way, cleaned up the plant beds, weeded, picked up trash, cleaned graffiti, and installed new garden signs. Children were encouraged to help! And help they did! Today the beloved community park is looking better than ever. What's a Play Day? Well, it's exactly what the name implies. A Play Day helps build awareness for the importance of play, strengthen your community, and bring old-fashioned fun to your neighborhood. Fontana, Ariz. "organized several picnic style games and activities including: hula till you drop, potato sack races, cha cha slide dance contest, and the Rock Paper Scissors Championship of Fontana!!" Playful City USA Mount Holly, N.C. held a Play Day to celebrate "the official opening and dedication to the new playground at Woodlawn and improved amenities, games, activities, refreshments and prizes." Activities at Playful City USA Coventry, Conn. "included a climbing wall, moon bounce, inflatable basketball challenge, a costume swap, face painting, pumpkin carving, pony rides... hoop dancing, sports, a giant chess set... and a costume parade and contest!" 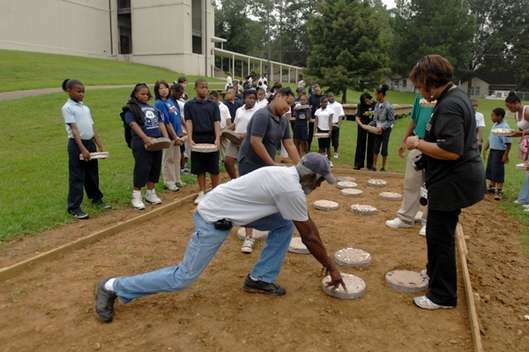 Playful City USA Lyerly, Ga. "hosted two Play Days... and both were huge successes! On Thursday, all of the special education students in our county joined at our park for the first Play Day. This was the first time ever that all those kids had the chance to be all together at the same time and place. They also got to test our brand new Jennswing, which allowed several kids who normally aren't able to participate the chance to swing alongside their peers!" Ready to organize your own Play Day? Get started here.